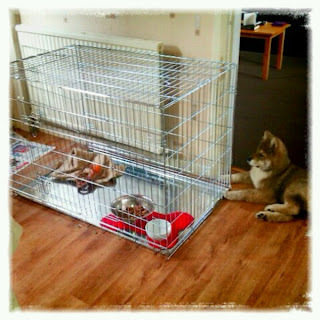 We had the new dog cage delivered today (bargain - £35 on ebay - free delivery) but it's FECKING HUUUGGGEEE. I'm thinking of moving in myself. Yoshi has been for a wander round in it, dragged his toys and blanket in and out, pissed in it twice, had his tea in there and keeps having a little snooze in it. But in the picture, he looks a bit bewildered by it all. He probably thinks it's a luxury apartment after the small cage he was in until last night. Anyway, how do you think the dog repaid this random act of kindness? 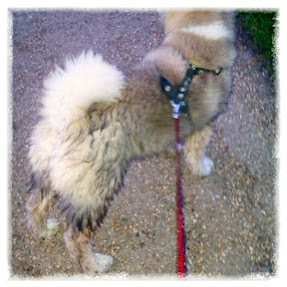 By throwing himself into the canal on his walk and almost dragging me in with him! Oh yes, indeedy. He is snoozing now - probably dreaming of a cheeky little duck giving him the bird.